Approximately 53 million Americans—1 in 3 workers—are considered freelancers, according to this 2014 report by independent research firm Edelman Berland. The so-called “gig” economy has garnered a lot of international attention. Even presidential candidates are commenting on it as an issue for the 2016 election. The post A Primer On The Gig Economy appeared first on CCN: Financial Bitcoin & Cryptocurrency News. The post Bitcoin Trading On Tenterhooks appeared first on CCN: Financial Bitcoin & Cryptocurrency News. Dr Craig Steven Wright, the Australian named as the alleged creator of bitcoin, runs a company that spent tens of millions building the fastest computer in the Southern Hemisphere. And it was working on blockchain technology — the software that underpins bitcoin. His company was in the process of commercialising work on "smart contracts" and other applications using the blockchain when he disappeared. Or at least that's what documents put out by his company, DeMorgan, suggest. Doubts have been cast over these claims online. Dr Wright was also trying to revive another bitcoin company he set up that had fallen into administration, according to documents uncovered by Business Insider. Dr Wright, an unknown Australian computer-science and cybersecurity entrepreneur, was named this week by Wired and Gizmodo as the potential anonymous creator of bitcoin. Somebody or a group of people using the name Satoshi Nakamoto invented bitcoin in 2009. Bitcoin is a type of digital currency that uses cryptography to move money and records it in a ledger without the need of a bank. Dr Wright has disappeared in the wake of the accusations, scrubbing all digital records of himself and becoming unreachable at his home. But snooping by Business Insider has revealed some interesting details about what he was up to before he vanished. 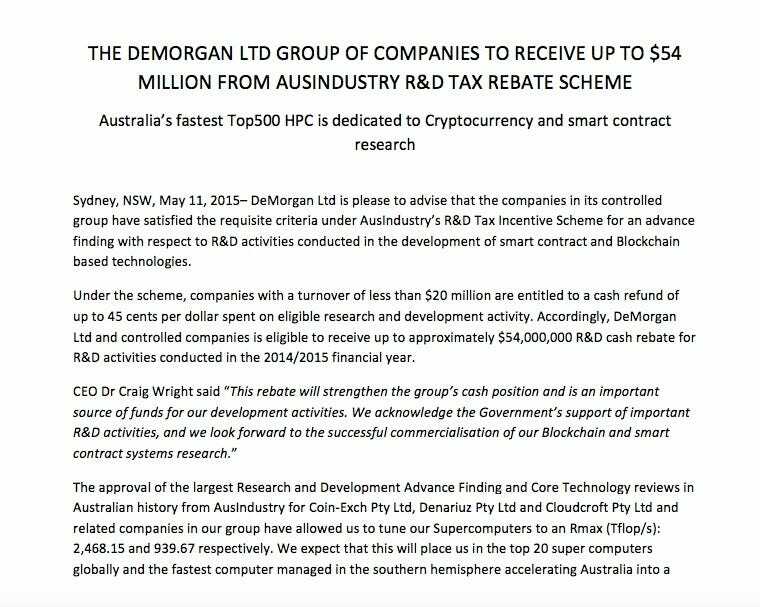 A document dated May 11, 2015, on the website of Australian company DeMorgan — of which Dr Wright is CEO — claims the company was due for a tax refund worth A$54 million (£25.8 million, $39.1 million) for building a supercomputer to work on blockchain and cryptocurrency projects. The blockchain is the software that underpins bitcoin, recording who owns what and enabling transactions. It's the "trust machine" in the system that has got everyone from Goldman Sachs to The Economist excited. The document, since removed from DeMorgan's website, says: "Under the scheme, companies with a turnover of less than A$20 million (£9.5 million, $14.5 million) are entitled to a cash refund of up to 45 cents per dollar spent on eligible research and development activity." That implies that DeMorgan spent at least A$120 million (£57.3 million, $86.9 million) developing the supercomputer, assuming the company received the full 45 cents per dollar rebate. The computer is reportedly included in the TOP500, a list that ranks the 500 most powerful computers in the world, and the document states that the rebate, and other R&D refunds to related group companies, will allow DeMorgan to fine-tune its computer to "place us in the top 20 supercomputers globally and the fastest computer managed in the southern hemisphere." Both Wired and Gizmodo noted that Dr Wright had supercomputers, with Wired saying he had two — including Co1n, the most powerful privately owned supercomputer in the world. But there are some doubts circling online that Dr Wright had any supercomputers at all. High-performance-computing firm SGI has denied any involvement with Cloudcroft, a subsidiary of DeMorgan, despite an apparent letter from the company showing they worked together. The rebates relates to work already done on "the development of smart contract and Blockchain-based technologies." 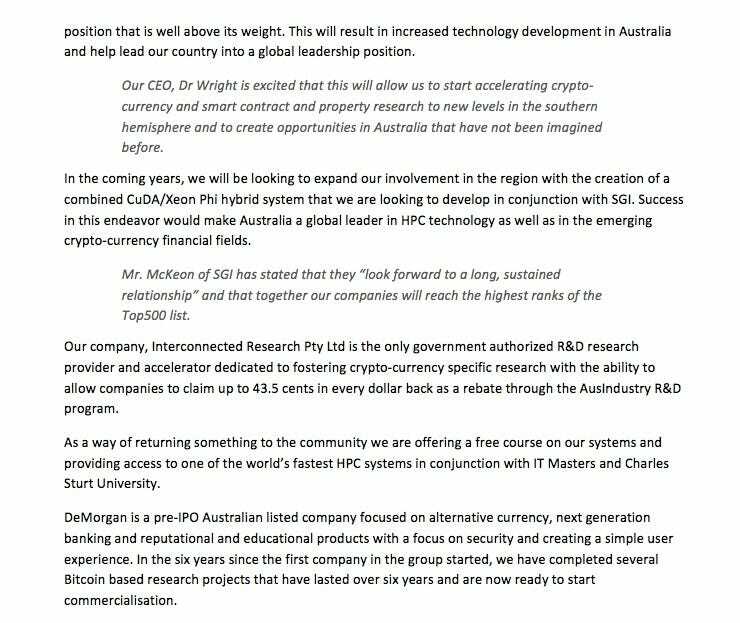 The statement says it hopes investment of the money can make "Australia a global leader in HPC [high-performance-computer] technology as well as in the emerging crypto-currency financial fields." This rebate will strengthen the group’s cash position and is an important source of funds for our development activities. We acknowledge the Government’s support of important R&D activities, and we look forward to the successful commercialisation of our Blockchain and smart contract systems research. DeMorgan has taken down its website and the related documents but you can see screen grabs of the release that Business Insider got before it was taken down below. 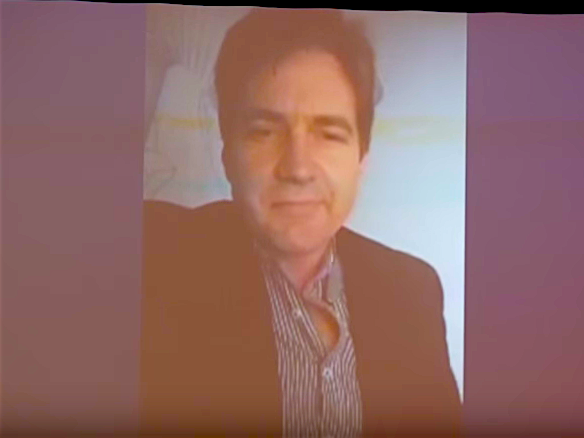 Meanwhile, it looks like Dr Craig Steven Wright was in the process of trying to revive another defunct bitcoin company he founded when he was allegedly unmasked by the press. Hotwire, one of several companies set up by Dr Wright, was put into administration in June 2014 with debts of A$12 million (£5.7 million, $8.7 million) last year. Wright owned just over 75% of the business, putting in A$23 million (£11 million, $16.6 million) worth of bitcoin. But it ran up debts of A$12 million (£5.7 million, $8.7 million) it couldn't meet and was taken over by administrators McGrathNicol last year. The company, which had 40 staff, was set up in 2013 to try and set up a bitcoin bank, according to Wired. McGrathNicol lists the business of Hotwire as: "Research and development on e-learning systems and e-payment systems and software. Hotwire acquired its software through a range of complex bitcoin-related transactions." A document dated two weeks ago from McGrathNicol shows DeMorgan is currently trying to reach a deal with its creditors to retake control of Hotwire. DeMorgan and the company directors are offering an immediate 10 cents on the dollar to creditors, with the promise of a further 20 cents on the dollar once a 5.5 million Australian dollar (£2.63 million, $3.9 million) tax rebate comes through. That rebate covers "complicated, related party transactions involving Bitcoin and software research and development." The company doesn't have much in the way of assets, with McGrathNicol listing only a tax rebate claim and job contracts of "minimal realisable value." And, as revealed by Business Insider Australia, the Australian tax office was challenging the tax rebate and fined Hotwire $1.7 million Australian dollars (£810,000, $1.23 million). Like most of the tech journalists in the world, we've tried to reach Dr Wright for comment but have been unable to. The post Global Economic Outlook: November Capital Outflows From China Biggest Ever appeared first on CCN: Financial Bitcoin & Cryptocurrency News.